Arjun Atwal holds the Wyndham Championship aloft after becoming the first Indian player to win on the PGA Tour. (CNN) -- Arjun Atwal's narrow victory at the Wyndham Championship secured a slice of golfing history as he became the first Indian-born player to win on the PGA tour. The 37-year-old from Calcutta sank an eight foot par putt on the final hole to win by a shot from American David Toms, and become the first qualifier to triumph on the Tour in 24 years. Atwal lost his Tour card in July but shot a final round 67 at Sedgefield Country Club to finish on 20-under-par and scoop the top prize of $918,000. "I told my caddie, 'We've got nothing to lose this week. Just go out there and try and win it'," Atwal told the official PGA Tour website. "Guys are going to be out there trying to secure their FedExCup spots or whatever. We've got nothing. I don't have a card. I don't have anything. Just go out there and free-wheel it, and that's what I did this week. "I'm pretty sure it's going to be huge back home," Atwal added. "My in-laws called my wife Saturday and said the coverage was just unreal with me leading. I know there were a lot of people in India and Dubai that watched me play. I've had a lot of messages." I'm pretty sure it's going to be huge back home. I've had a lot of messages. Atwal started the final round three shots clear of the chasing pack but his lead was gradually whittled away until he was briefly locked in a seven-way tie. But a vital birdie at the 16th saw him regain control. He then recorded par on the final hole by firing his second shot towards the spectators' tent at the back of the green, taking a free drop and getting up and down in two for the win. His victory gives him a two year Tour exemption and a place at the 2011 Masters at Augusta. "That was huge," Atwal said after his landmark victory. "I was really nervous over that [last] putt. My heart rate was probably 150." Atwal used to be a practice partner for world number one Tiger Woods but lost his Tour card last month after slipping too far down the money list when his minor medical exemption ran out. Three years ago Atwal was questioned over an incident in which the driver of a car who was allegedly trying to race him down an Orlando street crashed and died. He was cleared of any wrongdoing after a year-long investigation. Atwal has won on the European, Asian and Nationwide tours, but his first PGA victory was warmly greeted back in his home country. 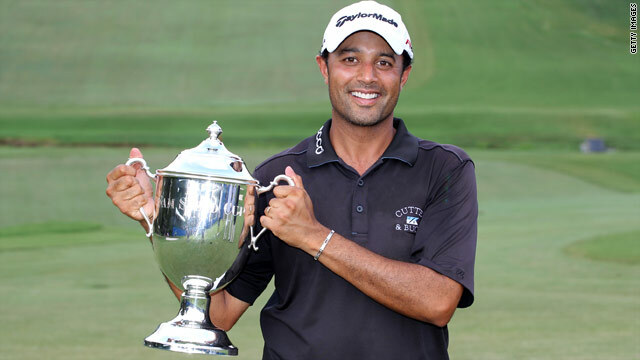 "I am delighted that Atwal has this great victory on the PGA Tour," Sports Minister Manohar Singh Gill said in a statement carried by AFP. "It is truly a remarkable achievement and puts Indian golfers on an even higher level internationally."